Chrichton's World: Review Tusk (2014): Kevin Smith ventures into the bizarre and it's terrifying! Review Tusk (2014): Kevin Smith ventures into the bizarre and it's terrifying! 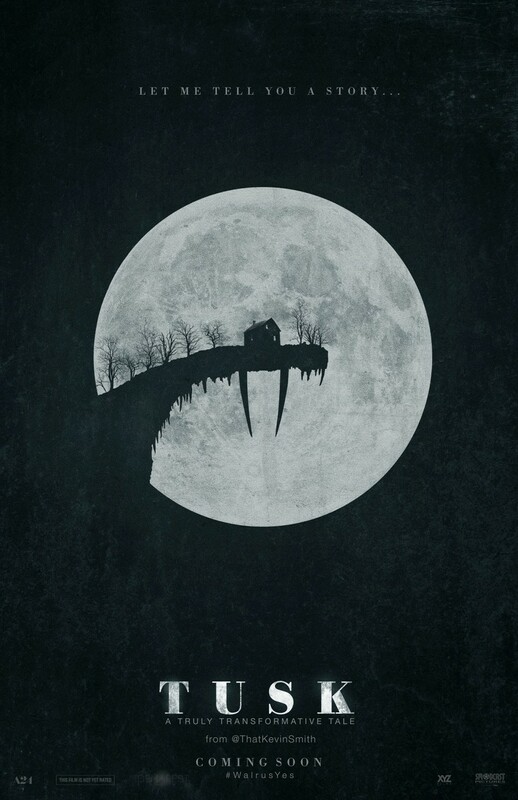 When I read Kevin Smith was making a horror comedy called Tusk I was intrigued. I like most of his films and his sense of humour. Honestly, I was expecting something light and funny. What I got instead was the complete opposite. Tusk is not your typical horror comedy where the scares are mixed up with laughs. Actually the comedy element is downplayed considerably unless you count in the poorly executed Guy Lapointe bit. But more about that later. Sure the film does start with main character Wallace Bryton (played by Justin Long) making fun of a youtube video (which was hilarious BTW) but very soon after events start to unfold that gave me chills. At one point the story becomes so weird and absurd that surprisingly was incredibly compelling. I think this was achieved because most of the cast took the film seriously. If they hadn't then this film would not have worked. From the moment we get to see what kind of predicament Wallace is in this film becomes rather disturbing and horrific. That is if you did not knew what was coming. I try to avoid watching trailers and such because these days you will have to if you don't want the story to be spoiled. So please if you have not seen this film don't watch the trailer or read about the film at all. Then you will see that the film has some nice surprises for you. Well, not exactly nice but one to remember for sure. I was shocked to see that Kevin Smith took me here. I got this heavy The Human Centipede vibe and could not believe Smith had it in him. But he did and for some strange reason it was very effective. I was enthralled and was eager to find out how the story would end. Until guy Lapointe makes his entry. It took me a while to recognize Johnny Depp but when I did I wondered why he was in this. He did not seem to fit in this film at all. I suppose it was meant to be comedic and surprising as well. Only it missed the mark completely. His role also seemed very pointless. He did not need to be there. In fact if he was not in it this film would have been even better. I know that Kevin Smith started this film as some sort of joke. But I am glad that I was able to watch this film without having things spoiled since it did give me a very interesting viewing experience. Now it is hard to recommend this film since it is so bizarre that it is bound to make people angry. Still if you want to give this a chance you should think of a film similar to The Human Centipede but one that is far superior to that one in every element of film making.